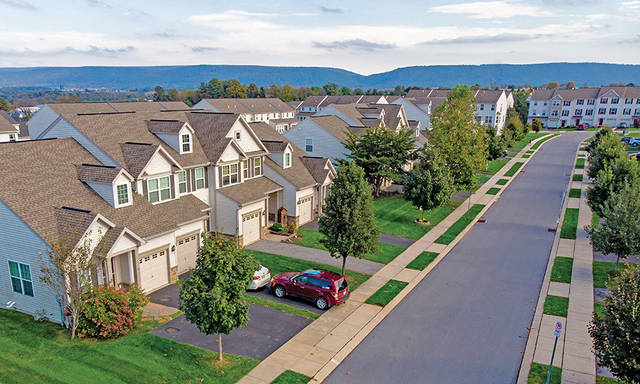 Nittany Aerial Photo and Video Homes in Centre County are selling fast, including in the Amberleigh development in Spring Township. 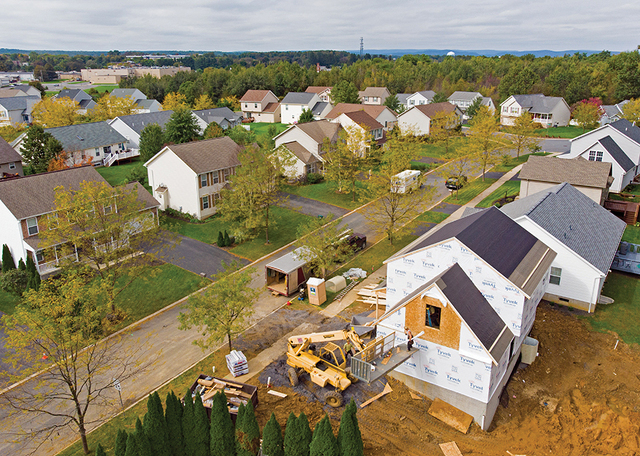 Nittany Aerial Photo and Video Construction at The Landings in Ferguson Township. Homebuyers Mindy Krause and her husband, Brandon, knew the drill. They’d show up at an open house this spring only to learn the home was already sale-pending. Or there were multiple offers on the table, putting them in a tricky situation: Do they quickly make an offer, without much time to weigh their options, or move on? The Krauses just wanted a two-story, four-bedroom home in the State College Area School District for their growing family. So when a brick colonial in College Township’s Fieldstone neighborhood hit the market in early June, they didn’t hesitate. They toured it the same day and made a higher-than-asking-price offer in the hope of standing out among multiple bids. They got it, for $420,000. The Krauses were not alone in employing a quick-to-the-trigger home-buying approach, as the local real estate market has been on fire in 2018 for sellers, creating intense competition among buyers. Newly listed homes went under contract lightning fast, sometimes before they even made it to the local multiple listing service, or MLS. Sellers entertained multiple offers. Some buyers resorted to making their first and, quite possibly, their last offer, while others included escalation clauses, which say they will exceed other offers in the event theirs isn’t the highest. The market’s red hot, with little sign of slowing down. Jane Adams, another KBB agent, says the market has been so hot because there’s little inventory and low turnover. A look at the number of listings over the past few years underscores the trend. This year, from January 1 to September 3, 794 homes in the State College Area School District were listed for sale, according to data provided by the Centre County Association of Realtors. In 2017, the number was similar over the same time-frame, 781. Far more homes went on the market the two years before that. In 2016, there were 836 listings, 5 percent more than the number this year. And in 2015, there were 889, 12 percent more than the current year. “The demand hasn’t decreased. We have a constant need for housing,” Adams says, citing Penn State as an economic driver. And the homes that do go on the market don’t stay there long. The average, according to the Realtors association, was 21 days for homes in the municipalities in the State College district. House prices are also rising. In the State College area, the median price of homes listed from January 1 to September 3 this year was $324,900, according to the county Realtors group. That’s a 5.2 percent increase over the same time in 2017, when the median was $308,800. The Krauses, the couple that bought a home in Fieldstone, were on both sides of the red-hot market. Their 1,246-square-foot ranch in Ferguson Township worked for just them, but when they found out Mindy was pregnant in 2017, they realized they needed a bigger space. So they put their house in The Landings neighborhood on the market for $284,000 in May. They had bought the home for $199,700 in 2012, and over the years completed many home-improvement projects, such as replacing the flooring throughout and remodeling the kitchen. The Krauses, whose Realtor was John Lazos, decided to have a couple of days for showings for prospective buyers, and the strategy yielded several offers. They accepted one for $291,000, which amounted to the home appreciating in value more than $91,000 in six years. “We were pretty happy with the results at the end,” Krause says. Homes aren’t just moving fast in State College – the Bellefonte area is also part of the red-hot real estate market. According to the Realtors association, there were 340 homes listed for sale from January 1 to September 3 this year. Over the same period in 2017, there were 264. Even as the listings increased, the median list price for homes in the Bellefonte Area School District increased as well – 9 percent from 2017 to 2018, from $209,950 to $229,700. When Josh Lucas and his wife, Jeana, listed their three-bedroom 1950s Cape Cod in June, it sold for $271,000, $81,000 more than when they bought it in 2014 for $190,000. The sale went fast, Josh Lucas says. “We listed our house on a Friday, it hit the MLS that night, and we had four offers on Saturday,” he says, noting three of the four exceeded their list price, $259,900. At the same time they were selling, they were also on the lookout for a bigger home, one that could accommodate their family. They bought a two-story, 3,600-square-foot colonial for $315,000 on the outskirts of Bellefonte in Spring Township. The appreciation in their first home’s value also allowed them to buy their new home without it being contingent on the sale of the other one. Lucas says he was expecting to list the house around $240,000, but Adams and Heather Lukac, his agents, researched comparable sales and priced it at an amount aimed at drawing multiple offers. The pricing strategy for the sale of Christine Delaney’s three-bedroom townhouse in the Amberleigh development in Spring Township was right on the money, too. Delaney bought it in 2016 for a little more than $184,000, but this summer, she got a new job in Washington, D.C., and wasn’t immediately sure if she would sell or rent it out. She says she saw for-sale signs quickly turn into sale-pending signs on the townhouses in her development, and when she decided to sell, she hoped the same would happen. Her townhouse didn’t even make it onto the MLS, selling within 24 hours. She says she signed the listing agreement with her agent one night in July, and by the following morning, she had a showing lined up. An offer for $215,000, her asking price, followed a few hours later. Melissa Reichard and her husband, Matthew, are hoping to relocate to the Zion area of Bellefonte from Penns Valley. They plan to build their forever home near her parents, and the plan is to be there in time so their oldest child can start kindergarten at Marion-Walker Elementary School in the next school year. They figured they needed to proceed with selling their 2,000-square-foot ranch house in Potter Township so they could move forward with the builder. Again, it only took a few days. After listing it on a Friday night in September, they had two showings a day for the next four days. They accepted an offer above their $229,000 list price and were set to close at the end of October. They stood to see their home appreciate almost $25,000 from the time they bought it in 2017 for $205,000. Spearly, the agent for the Reichards, says that in the past people could expect to have built equity in their home on average three to five years after purchasing it, when factoring in their costs to buy it. “Two years’ time to increase by $25,000 is significant, in my opinion,” she says. Mortgage rates have risen with home prices in State College and Centre County. Phil Vollmer, a senior loan officer at Fairway Independent Mortgage Corp. in Ferguson Township, says 30-year fixed mortgage rates began 2018 at 3.875 percent for buyers who met criteria such as a very good credit score and a 20 percent down payment. Over the year, though, rates have increased to 4.875-4.99 percent, and Vollmer says he experts expect them to continue rising in 2019. Whether that will impact the real estate market here remains to be seen. Adams, of KBB, says she expects the trend to continue into 2019 because there is just not enough housing for everyone who wants to buy. Mike Dawson is a freelance writer who lives in College Township. Mike Dawson is a freelance writer in State College.